In the fast-paced world of technology where phones evolve from a mere communications equipment to a multi-purpose mobile handset, messaging also evolved into an avenue for entertainment through incorporation of stickers, group chats, social networking and now -- games. WeChat, the most-searched social messaging app in the Philippines (Google Trends, PH), was updated into version 5.1 to include gaming as part of its portfolio – bringing fun and addictive games that would let you play with your friends or even people nearby. 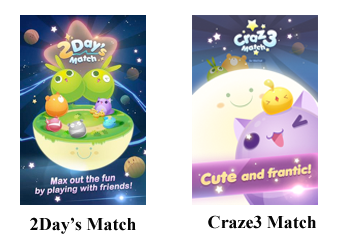 Initially, there were 3 games available: the Pencil Pilot, a classic shoot fest that allows you to control an airplane and shoot incoming enemies; 2Day’s Match, a casual puzzle game played by uncovering two similar tiles; and the Craze3 Match, a matching game that requires players to match tiles in groups of at least three similar animals. GunZ Dash, the newest addition to the WeChat games, is a side-scrolling adventure-type of game whose goal is to rescue a friend in trouble. Players can choose to play either in solo or multi-player mode, can boost scores by collecting coins and speed through worlds for a more exciting journey in the fantasy world. Soon to be offered in WeChat games is Wreckless Racer, a racing game played in an enticing cutting-edge graphics, full of thrilling obstacles up to the finish line. Version 5.1 also upgrades the heart and soul of WeChat. Enticing new features were introduced to the existing text and voice messaging functions, allowing a more enjoyable and convenient messaging experience. WeChat now allows you to form a larger circle of friends by accommodating up to 100 unique users in a single chat group. This expands the previous 40-person chat group into 100 members that can simultaneously chat and exchange stickers within the chat group. Aside from the username, you can invite your friends to a WeChat group chat via the QR code (available in the latest version of Android and iOS). 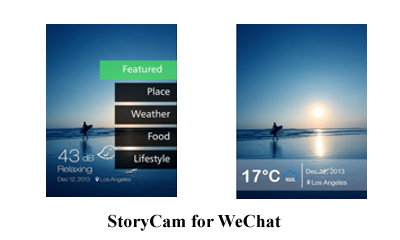 StoryCam is now available for WeChat. StoryCam provides a variety of filters and watermarks that give users the option to change the theme for their photo based on Places, Weather, Food, Lifestyle, and Featured. 13 free filters along with real-time location-based information such as date, location and weather can be stamped into the photos and be easily shared thru WeChat friends, WeChat Moments or thru email. WeChat friends can engage in a live voice chat session with each other (available in the latest versions of WeChat for iOS and Android). This can be activated by clicking the "+" in the group conversation and select "Live Chat". An invitation message will prompt to the group chat's members automatically. To talk, hold the button in the middle and wait for the tone until the indicator light turns green. Your Live Chat group will receive and hear your message immediately. Similar to a walkie-talkie, only one person can talk at a time. A red light indicator will light up if you press the button while others are speaking and won’t allow you to talk. Update also brought WeChat messaging with a more apt and convenient management of contacts and messages. Users can now keep their favorite text and voice messages, photos and videos to “Favorite Messages”, a cloud computing storage service for used for mobile social communication. This will give users the ability to view and share content again anytime, anywhere. Aside from this, email registration is now available for WeChat. Users can register through their email and easily migrate their email contacts to WeChat and start chatting with friends. For instance, Gmail Contact Integration feature allows users to link to their Google account and discover other WeChat users so they can be added to their friends list. For Windows phone OS, version 5.1 also allows WeChat group capacity to accommodate 100 members, with multiple-message-forwarding also allowed. Stickers can also be previewed prior to download by pressing and holding the sticker group. For Android, version 5.1 also introduced the 100-member WeChat group chat, sharing of WeChat Games! achievement, Solo or multi-player mode for Pencil Pilot, and preview of stickers and message draft before sending. Iphone iOS 5.1.0.6 update also allows sign-up via email, accommodates 100 members on the WeChat group chat, sticker and message draft preview, enable voice call to WeChat friends and manual WeChat files clean-up to save on capacity. Users can also export the chat history via email for archiving purposes. For Blackberry 3.0.3 update, users can communicate with WeChat friends across platform, find and communicate with people nearby through shaking your phone, send stickers, and post and comment on pictures on Moments. WeChat 5.1 is optimized to support the latest iOS and Android updates. Visit www.wechat.com to download the latest version of WeChat or visit the Apple Appstore for iOS or Google Playstore for Android.